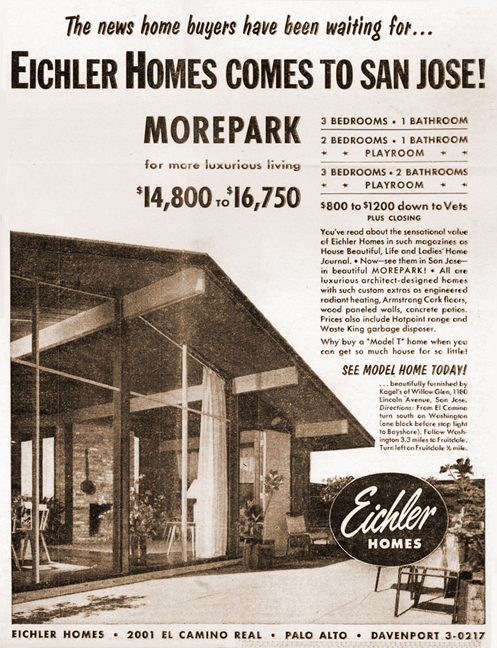 This vintage newspaper ad heralded the San Jose debut of Eichler Homes, which arrived at Morepark in 1951. 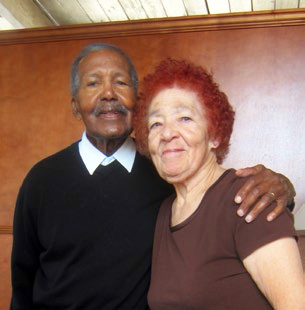 John Carter (seen here with wife Gloria) has lived in Morepark for more than 50 years. Elyse Frisch and Dan Swiney with son Harlow. Keith and Megan Blaine, new to the area, had never heard of Eichler when they came upon "our house," Keith says. They were stressed because they had to find a home quickly and because of the competition. But the home provided a respite. "It was one of the most soothing places I had ever been in," Keith says. "The house is all lauan [mahogany], and especially on a summer day it feels like a retreat." 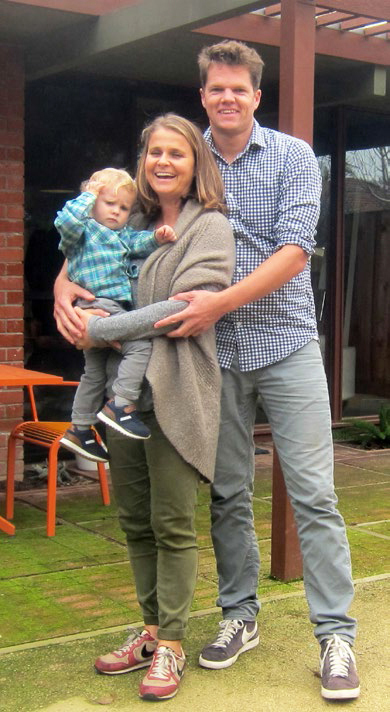 Keith and Megan, who are architects working on, among other things, the new Apple campus just a few miles away, are only the second family to own their home, a classic Anshen and Allen model. "It's a very simple design," Keith points out—a four-room house, if you count the living area, dining, and open kitchen as one room, with no wasted space, and only a stub of a hallway between the two bedrooms. It's got a sloped roof over the public spaces, a flat roof over the bedroom, with overhangs and windows arranged so sunlight comes in when it is wanted and kept out when it is not. "It's a responsive design," Keith says. He says he and Megan appreciate their house's "structural honesty and material honesty." "The ceiling is also the roof," Megan adds. "And the feeling in the space is very relaxing. It's dark at night and it's light in the day. It feels very natural." Homes range from about 1,000 to 1,450 square feet (though Megan measured hers and reports the home has exactly 950 "usable" feet of space) and sold when built for $14,800 to $16,750. Homes originally had three bedrooms and one or two baths; some had a 'playroom' as well. Eichler's architects got creative with some of the models here, Karina Marshall notes. The living rooms of some models are essentially garden rooms, with glass walls on two facing sides, their inclined roofs supported by upside-down trapezoids, giving the homes a space-age look. "This is very much an experimental house," Karina says of the model. "[Eichler] was trying different things." Another striking model, with a low gable over the main living area, covers the carport with a single-sloped roof that seems like it is about to lift off in flight. Karina, though a newcomer, has become the neighborhood's unofficial historian, having pored through the archive of architect A. Quincy Jones in Los Angeles. His archive includes much on the neighborhood, including designs by both Jones & Emmons and Anshen and Allen. A few years ago, when some of the Morepark newcomers arrived, homes there were selling in the $600,000s. Adam and Apolonia Dye bought theirs from the bank in 2010 for all of $476,000. One recent listing was for $940,000—still less than in other Eichler neighborhoods in San Jose. "Over the last year there were five or six houses that have gone on sale," Karina says. "Everyone who purchases one are young families with kids. There haven't been a lot of kids in the neighborhood." The newcomers, Mark Winkler says, "all are super enthusiastic about being in Eichlers." "What sets the neighborhood apart is, we're all excited to be here, and we're all trying to make it so much better," says Elyse Frisch. "We watch what each other are doing with the houses. We get good ideas from each other, like what to do with the backyard." In Morepark, folks go out of their way to retain or restore the Eichler look—and ponder deeply before making changes. In the Dyes' home, most of the mahogany paneling had been "replaced with horrible highly textured stucco" before they arrived, Adam says. One panel remains by the dining table. "It was really important for Adam to keep this wall," Apolonia says. 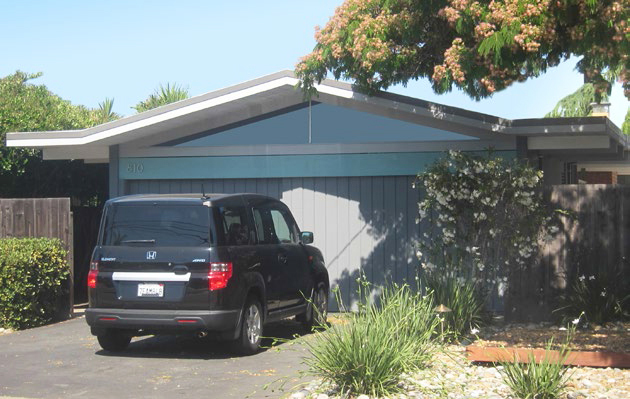 "He wanted to keep the character of the Eichler house." When Megan and Keith Blaine redid a bedroom for their son Henry, they gave the room a lighter look, but not by painting the plywood panels. Instead they removed them from the walls, wrapped them in light fabric, and reinstalled them, thus preserving the wood for later viewing.